Warm up and establish a new 1RM or 3RM. No tempo today! It’s important to remember that the people who own and run these affiliates are small business owners. They are not part of a big globo gym system. It’s your mom-and-pop gym that happens to be the best gym in the area. If you’re a member of a CrossFit Affiliate, then you know what we are talking about. This is their passion project. 100% of money raised will be donated to affiliates in the Houston area who need help. Join us this week for #HelenForHouston. Helen is one of the most popular benchmark workouts in CrossFit and has been done over 126,000 times on btwb. As an added bonus, BTWB will be picking three random blog commenters today and giving them their choice of CFSBK merch (hat, shirt, socks, whatever!) as a thank you for participating! Additionally, we’ll have a computer set up so you can donate to this and other relief organizations like the Red Cross, UNICEF USA, Houston Food Bank, and Texas Diaper Bank if you need that extra nudge to donate to any organization providing relief. Every little bit helps! This is a good time to recognize that staying fit makes us all better citizens, more equipped to help ourselves and those in need in times of crisis. So come on in today or tomorrow, do your best “Helen,” and don’t forget to note your results on today’s blog post! Celebrate the end of summer with your CFSBK buds. This afternoon, CFSBK will be hosting a potluck at Prospect Park. Come lounge on the grass, throw some frisbee, toss the ol’ pigskin, and hang out with your gym buds. What better way to celebrate Labor Day weekend? We’ll be on the hill south of the Picnic House from 2pm on. Bring a dish or drink to share. Friends, family, and dogs are, of course welcomed. We can’t wait to see you there! Haven’t posted yet on the new blog. I’m nervous. -heaviest I’ve squatted since Iron Maidens in February. used a belt starting at 225 because I wasn’t sure but everything felt great! -need to be faster on the runs. All kbs unbroken. All pullups as butterfly in 6/4/2, 6/6, 5/4/3. Knee not good so did not test the bsq. worked to 295# single. Knee not good so did not run. rowed which is unfortunately kind of appropriate. 11:15. Donated some $ to Humane society efforts for Harvey because kitties. Scaled pull-ups for jumping box pull-ups. Hit a new PR back squat woot woot! 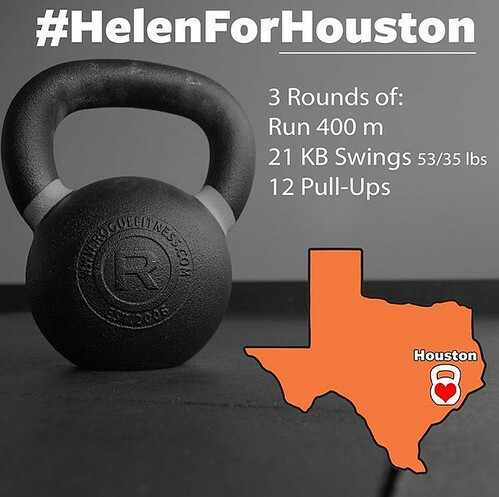 Did a bunch of stuff at OG today (deadlifts, supinated rows, and the Maverick complex from Flex on the beach), and capped it off with a scaled #HelenforHouston – subbed in ring rows for the pull-ups, and finished in 10:37. 255 for bsquat, which is pretty light normally but with my shoulder I’m just glad I was able to do it at all. 11:10 for helen — gotta drill running! 15# off my PR 🙁 So run down this week. Saturday’s workout yesterday at 8am. PRed back squat at 235, failed 250.
tried this rx’d, but pull-ups would have taken forever, so switched to jumping after 5. Back Squats 300lbs (a new 20lb PR!). Had another 10 or 15 lbs in the tank. #HelenForHouston 14:08m Rx. Not my wheelhouse – running slow, pull-ups slow, etc. Happy to do it with a large excited crew for a good cause. 11am-12:30pm AGS with Snickers, mostly recovering from Helen and then getting a good pump for a weekend at the beach. Sad that I’ll miss C&J testing tomorrow, but had 3 PRs this week! First time dropping in! Had a great time, thank you! 1pm class – Helen 13:06 – first time running since giving birth 4 months ago. Ways to go to get back to where I was but it was great to do today! Getting lower finally but still working on the proper form as oppose to go higher weight and I did around 70 lbs 3-5 times! Huge shout out to Brett for helping me ! “Helen” in 10:46 with rowing, Russian KB, and ring rows (one day all of my various injuries will be healed?). Glad to be supporting this cause! Back squat PR (235, probably full depth, since JB was watching it and I didn’t hear a “no rep”.). Then, Helen (with jumping pull-ups), 12:10. Then AGS. Helen in 11:05 with jumping pull ups and 12kg kettle bells. Back squat PR at 180 after all the tempo work recently. Shoulders feel like they have sand in them so I scaled the kettlebell swings to 16 kg, Helen time was 10:22. Completed in 12:15 with a 20K bell.